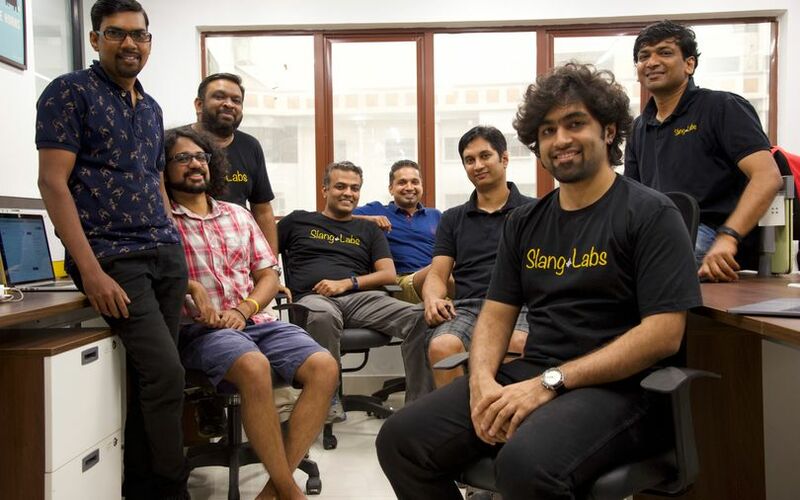 Kumar Rangarajan (fourth from left) and his team at the Slang Labs HQ in Bengaluru. TechCircle presents Founders Reboot, a new fortnightly series in which we profile successful Indian entrepreneurs who have chosen to start from scratch again with new ventures. Once an entrepreneur, always an entrepreneur. That’s Kumar Rangarajan’s explanation for foregoing his sizeable stock options at Wall Street darling Facebook. Rangarajan was vested with Facebook shares after his app performance monitoring startup, Little Eye Labs, became the social networking giant’s first Indian acquisition in 2014. The Little Eye Labs team was then absorbed into Facebook, but it didn’t take long for Rangarajan to get restless. "An entrepreneur will always want to do something. A large campus with hundreds of people is never like your own small setup," he told TechCircle. Something clicked during the spring break of 2015. Rangarajan had recently bought an Alexa device and his two kids became quickly accustomed to issuing voice commands. He was driving with them from Silicon Valley to Los Angeles when his daughter asked the car’s old-school stereo system to turn up the volume. The rejection that followed planted the seeds of what was to become Slang Labs, a multilingual voice-based assistant platform that can be integrated into apps. Even after the move to Facebook, the old Little Eye Team had been meeting regularly for coffee. Casual conversations often turned into brainstorming sessions and the idea for Slang Labs gradually took shape. Rangarajan teamed up again with Little Eye co-founder Giridhar Murthy to start their second venture. He also invited Satish Gupta, a former colleague at Rational Software, to join as a co-founder. The other Little Eye folks including Aditya Kulkarni, Lakshman Kakkirala, and Satyam Kandula showed their support by investing in the venture. They combined to put in $250,000 as seed capital. "We all still see ourselves as one team," says Rangarajan. His kids protested, but Rangarajan took the emotional decision to return to Bengaluru for his new startup, where he is 'Chief Slacker' according to his LinkedIn profile. Slang Labs has since gone on to develop a software development kit (SDK) which enables apps to understand and react to human voices. In other words, it helps build a smart multilingual assistant. "While Google Assistant and Alexa can help you do a lot of things using voice commands, the experience becomes broken once you are inside an app. They made voice mainstream but we need to take it one step forward," he says. Slang’s SDK can be integrated with any app for adding voice as a feature within it. It helps add voice capabilities in Indian languages even when the display language on the app remains English. "Using a voice assistant on Swiggy or Zomato to flip menu pages of a restaurant is far easier as you have a visual backup confirming your choice,” he says. Earlier this year, Slang Labs raised $1 million from early-stage venture capital firm Endiya Partners, which was an investor in Little Eye Labs as well. Rangarajan says that while it is easier to raise funding these days, past successes leads to higher expectations. And there are some obstacles to overcome which are not fully in Slang’s control, with existing language translation solutions such as Google’s speech-to-text still a work in progress. "Also, the challenge in India is that there is always a hesitance to pay for such products by startups when it is still not the norm in the market," he added. The company is still running a few pilots or proof-of-concepts (PoCs) and has not found many takers as yet. However, Rangarajan is certain that he is in the market at the right time for the launch of such a product. That confidence possibly stems from the knowledge that he has history on his side. After all, four companies that Rangarajan has worked at have been acquired while he was still on the payroll. So will Google or Amazon come knocking? "I have not met them yet!" he says.